Records state “in 1604 Dundee Corporation contributed 40 merks to help repair the `brig of Monifieth`. As the name Milton suggests there certainly has been industrial premises beside the Dighty estuary for at least around three hundred years. On the journey through Linlathen den, Dighty water was used in the Panmurefield Bleaching operation of whitening the brown Osnaburg cloth, produced by local weavers. Accommodation for many of the bleachfield workers employed by David Watson, namely Burnside Cottages, Milton were `home` to many families from the nineteenth century up to the early nineteen fifties. In the surrounding area near the Dighty, about one hundred yards west of what is now Albert Street, was a wind driven mill, supplying the power for a wood turner in the production of tools, bowls, household furnishings etc. From it`s source in the ground near Lundie, until at last it reaches freedom in the river Tay, this stretch of water is reputed to have been harnessed to provide power for over seventy industrial operations. 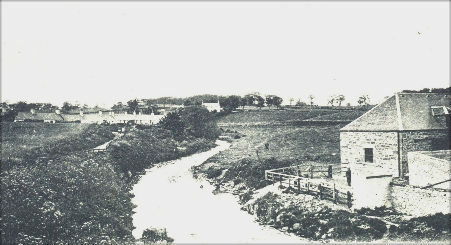 At Milton of Monifieth in the eighteenth century, a separate hamlet from what was then known as the Kirkton of Monifieth, there was linseed oil extraction mill. 1794 records show it as producing 800 bolls of oil, which apart from a few pints sold locally, were exported to London. Another product from this operation was cattle feed , exported to Yorkshire farmers. 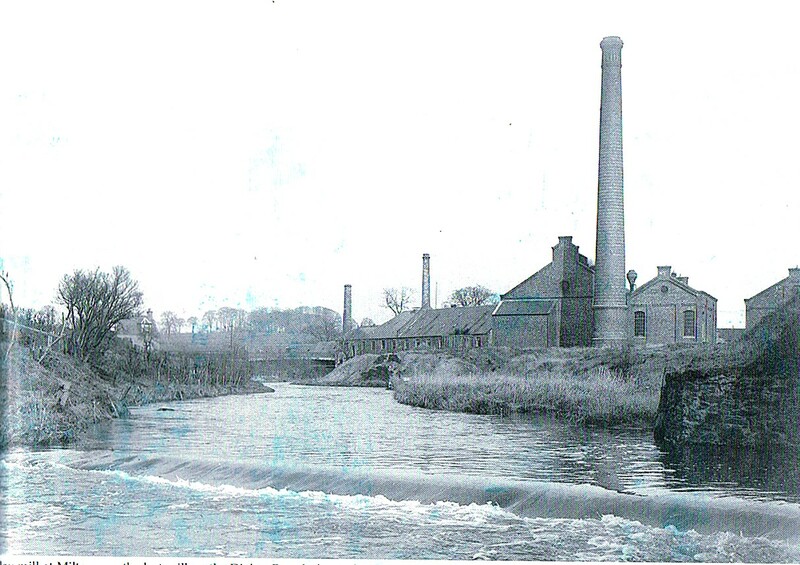 There was also a `fulling` mill, thread mill, several tanneries all in business at Milton prior to 1845. In the early part of the nineteenth century the introduction of flax spinning to the district was by a partnership of Messrs Baxter & Fairweather. The firm employed one hundred workers. After several years of business the firm was hit by tragedy, when in August 1813, Robert Baxter late one evening was stranded by the incoming tide on the Ladybank, in the river Tay, and accidentally drowned. 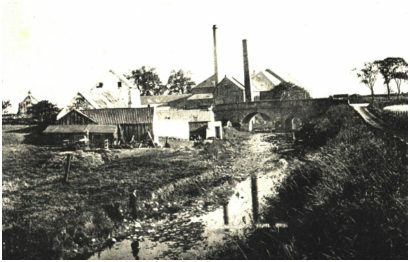 The mill was managed until 1820 by Robert Fairweather the surviving partner. Mr Fairweather as mill manager had his home in Grange Cottage, known to us today as Milton House Hotel. 1850 The mill after standing empty for some time `housed ` a flour mill. Also on record as carrying out `Flax Heckling` at the Milton Mill premises was a firm named Thomson & Fearns. Monifieth `fishings` are mentioned in the records of Arbroath Abbey 1201,in connection with the `gifting` of land to the Abbey by Earl Gillechrist. In 1777 the rents of the salmon fishings in the parish were £130 per annum. Salmon at that time retailed around one and a half pence per pound. In 1825 over seven hundred salmon were recorded as being `taken` on one tide. These fish were packed on ice then sent by boat to the London market. During the eighteenth and nineteenth centuries a clandestine industry complemented the income of the local residents. Smuggling of contraband goods. The mouth of the Dighty was just the spot for many a French lugger to off load it`s cargo of kegs in the hours of darkness, then be off again before day break. Stories still exist of `gaugers` lying in wait for the men from Monifieth who moved the illicit goods. 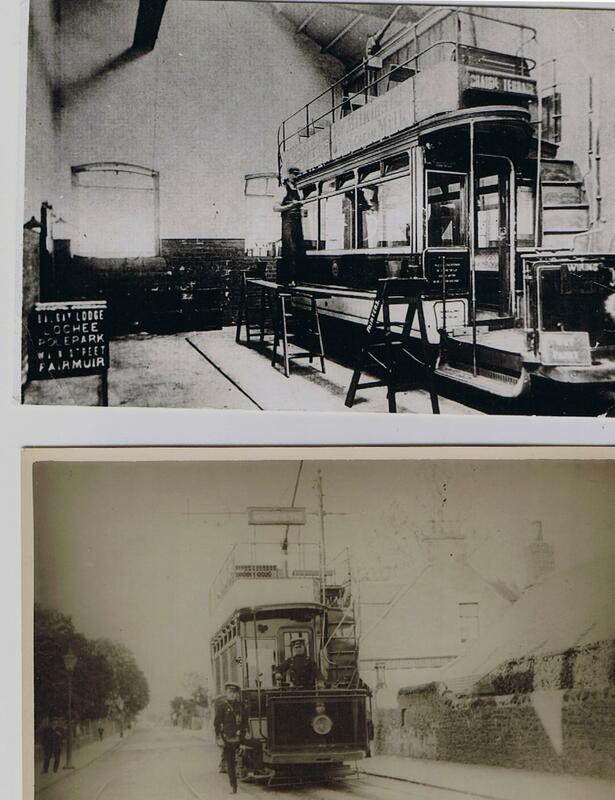 June of 1905 it was agreed by Parliament that a Tramcar service be introduced between Dundee High Street and Monifieth. Milton of Monifieth was chosen as the favoured site for building the Monifieth Tram depot. By November of 1905 the civil engineering firm of Balfour Beatty had not only built the tram shed, power generators, staff accommodation, they had also installed the power lines, supporting poles and `put down` the track. The tramcars were assembled in the purpose built trams car shed at Milton. The power generation system was serviced by the Dighty water. The withdrawal of the tram service in 1931 brought to an end of the need for tram car accommodation and services, however, the Milton industrial buildings have seen use as army barracks, carpet factory, house kit building manufactory, small industrial units and offices. The civil engineering firm also built the two storey, four apartment block opposite what is now Milton Street. It has been for generations known as “Balfour’s Building”. We cannot leave Milton without a mention of those wonderful creations, still bringing to mind so many happy memories, to so many of the natives of Monifieth. Still referred too with great affection, it has been said so many times to myself and others, “I`d move back to Milton tomorrow, if my prefab was still there”. This entry was posted in Names and tagged Baxter, Dighty, Fairweather, industrial premises, Linlathen, smuggling. Bookmark the permalink. The Milton Dairy was also a working farm and owned and operated by the Millar family, Alexander and Agnes along with their children Alex, Charles, Nora (who died as a child) and Evelyn. I believe they had the dairy from t he early 1900 until the late 1920’s. Alexander and Agnes previously had the dairy in Broughty Ferry.